But when it comes down to it, all of the numbers suggest that the economy is still doing well. Let's take a look at the growth in real gross domestic product (GDP). This is a basic and reliable figure that measures the growth of U.S. economic output after accounting for inflation. 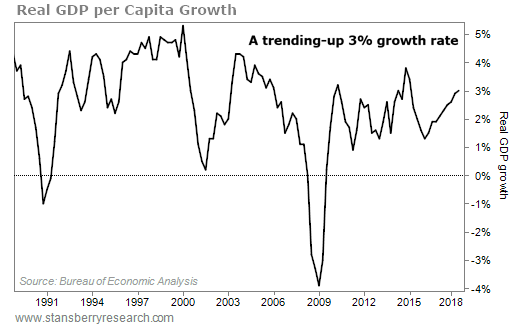 For an economy the size of ours, the best you can really hope for over an extended period is 3% growth. Sure enough, the last reading came in right at 3%. Most people will notice how strong the economy is through the employment numbers. Today, the unemployment rate is historically low – at just 3.9%... And the number of people filing for unemployment claims – that is, those who have been laid off or fired – has also stayed remarkably low. It doesn't take an economist to see this out in the real world. Employers simply can't find enough people for jobs typically filled by lower-wage workers. For instance, a Taco Bell in downtown Baltimore has a 20-foot-long banner advertising "Open interviews Saturdays from 7 a.m. to 3 p.m."
We asked a construction project manager how hiring in his industry looked. He told us, "If you can swing a hammer, I'll give you $25 an hour tomorrow." Despite the downturn in the market over the past few months, the economy hasn't begun to show signs of slowing. In fact, it appears to be getting stronger. So why has the market pulled back so sharply? In short, it has to do with the fact that the market is priced on future expectations. (I'll explain more in a moment.) It doesn't matter how profitable a company may be today... What matters for its stock prices is what it will make in the future. People who are new to the stock market often don't know this. They think a growing or profitable company always makes for a good investment. But growing profits are already reflected in the price of a stock. To outperform, you need to find stocks that will grow at a higher rate than the market expects. That's why the price of a stock is a pure measure of investor sentiment. It distills every idea every investor has into one single number. But we can break down some other measures of sentiment to see what's driving current prices. 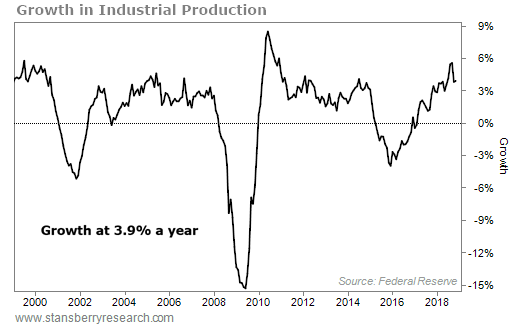 While the economic statistics we mentioned above measure actual activity from the past month or quarter, some indicators can tell us what decision-makers are thinking. That's a good sign... 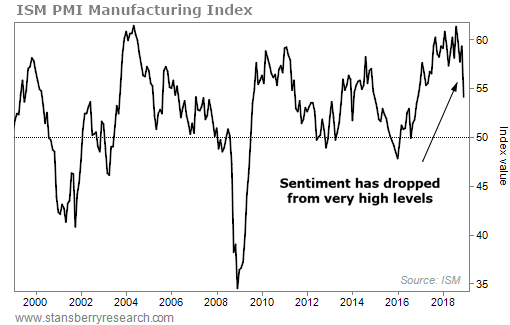 But the sentiment among industrial producers is falling. The monthly Institute for Supply Management ("ISM") survey asks production managers whether they expect expansion or contraction in their industry. These changes in sentiment have moved the market lower. You see, people who build factories, hire workers, and buy goods for their homes make decisions based on how optimistic they are about the future. When you expect something to pay off in the future, you don't need to spend your money to build it. You can spend someone else's money. That amplifies the whole process. 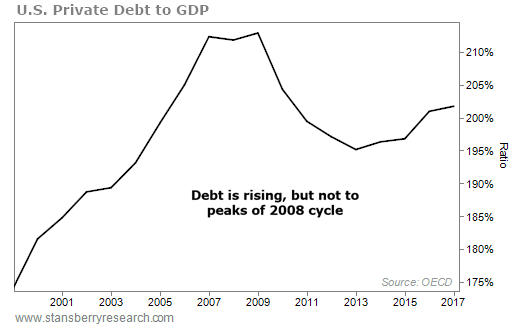 Laid on top of the economic cycle is the debt cycle. If people are optimistic, they can borrow money to build, to buy, or to invest. The stock market dropped more than 50% from the top in late 2007 to the bottom in early 2009 – including 37% in 2008 alone. Yet, the largest contraction in economic growth during the recession was just 4%. If you're like most folks, you probably would have guessed the contraction was much greater than that. But the stock market often whips around much more violently than the economy does. The cycle ends when banks and other lenders decide that they don't want to lend money anymore. That's when they start reining in lending and tightening credit conditions. Historically, the market does turn down before the economy does. The typical definition of a bear market is a drawdown of 20%, but we also like a list compiled by Ned Davis Research that has more nuanced criteria. According to that list, the bear market starts about eight months ahead of the initial recession, on average... though the range is wide. If you just look at the market, you'll see lots of false starts. Since 1900, according to the Ned Davis calendar, we've experienced 36 bear markets – but only 22 recessions. If the economy is going to tank, the market will tell you beforehand. But if you think every turn in the market means a recession is coming, you'll be way too fearful. That phenomenon led Nobel Prize-winning economist Paul Samuelson to quip, "The stock market has forecast nine of the last five recessions." If we don't see a recession, we're closer to a market bottom than the top. In other words, now isn't the time to sell... You already missed the big move lower. However, if credit conditions tighten, there's a real possibility we could see the economy sliding toward a recession and a more serious market pullback. We'll be watching our economic indicators more closely than ever to know exactly when that is happening. That's why a few months ago, I told my Income Intelligence readers it was time to increase their exposure to gold, the quintessential safe-haven asset in times of market uncertainty. It's not because I was predicting a market crash... I just wanted to protect my readers' portfolios with a "chaos hedge" in case the economy started to slow a bit. Most investors are sitting on huge gains from riding the bull market higher over the past several years. They're ignoring the possibility of a sharp market pullback... And in doing so, they're making a huge mistake. Now, I need to be clear... I'm not telling folks to sell all their stocks and go 100% to cash. During the event, I shared all the details of my current thesis – including why I think older Americans will need to make a critical decision in 2019 that could determine whether they work for the rest of their lives or enjoy a happy retirement. And regardless of your age, you'll want to make sure your money is protected when the next wave of volatility strikes. If you missed this event, that's OK... For a limited time, you can watch a replay right here. Editor's note: As Doc said, he's getting a bit cautious for the first time in a decade... That's why he dropped everything to host an urgent market briefing earlier this week. Doc told thousands of folks why he believes it's a good time to start getting conservative today. If you didn't get a chance to tune in, you can still see Doc's presentation by clicking here.